I found this unusual item in a collection of items left from the passing of my mother's aunt. It may look odd, but actually serves a purpose. The slim end slides easily into the end of an ordinary curtain rod and the larger, smooth end helps the rod slide easily through the curtains to hang. 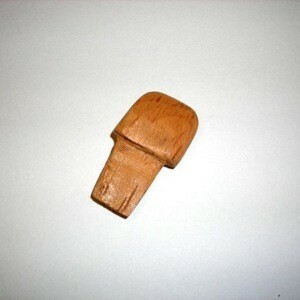 This is a homemade item, carved from a cork. If you're any good at carving things, you could probably make one for yourself. Wow, what a cool idea, and the fact that its handmade makes it all the more interesting. Thanks for sharing your find with everyone! My mother had something like this for her lace curtains but it was made out of pastic. It broke and I have been looking for one of these for years. You have given me a wonderful idea. I have some cork and i'm going to try to make one for her. Thank you!